Holland 1916, a manufacturer of product identification items, announced the Data Cinch, a durable, RFID enabled, steel cable locking zip tie designed for hard-to-tag assets. 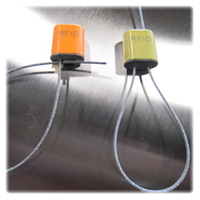 The Data Cinch features either an embedded high-frequency RFID tag or an ultra-high frequency RFID tag to offer tracking of assets exposed to harsh conditions. The Data Cinch comes with either a 1/16th inch steel cable offering a pull strength of approximately 800 lbs or a 1/8th inch steel cable offering a pull strength of approximately 1,000 lbs.